Why are my images not showing in email? 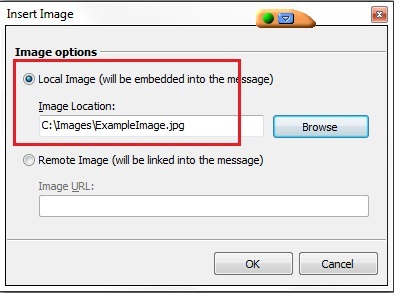 If a red x is displayed in the email you send instead of the image that you inserted into your GroupMail Message, it normally suggests that a full, local path to the image was not specified in the message. 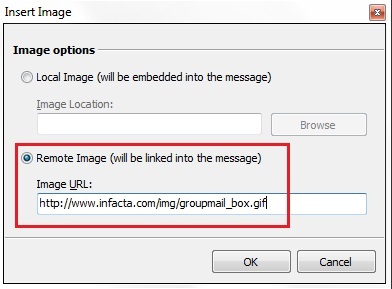 To insert an image with the GroupMail Message Editor, go to the Insert Menu, Picture. You are given two options. Local Image or Remote Image. Alternatively, if your Image is hosted on your website you can copy the image address into the ‘Remote Image’ field. To find out the Image URL, please go to the webpage that contains the image. Right click on the image and select ‘Properties‘. Copy the “Address URL” of this Image. Then paste it into the Remote Image Field. Many people ask us which is the best to use, Local Images or Remote Images. As a general rule we would always recommend Remote Images. There is no file size associated with the Remote Image so sending the email is much much faster. 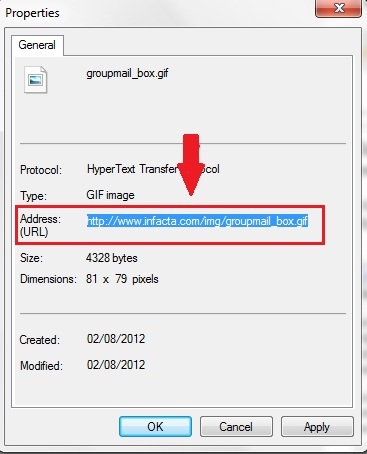 Images are not attached, so your clients mail server will not delete it as a suspected virus email. There is no large file size associated with your image so most mail servers will not treat it as ‘Spam’. ** We get quite a few support requests from customers who are frustrated that their message is taking a long time to send. Usually we discover that they are using local images and that is causing the message to be extremely large, especially when they are sent to hundreds or thousands of people. When using large or multiple images in your email, you should consider using a remote image path to the images rather than locally embedding them. This way, rather than weighing down each message with large, locally embedded images, you can link to the images hosted on the Internet. The effect, as far as the recipient goes, is the same; but the time to send your message will decrease significantly if you use remote images rather than locally embedded ones. 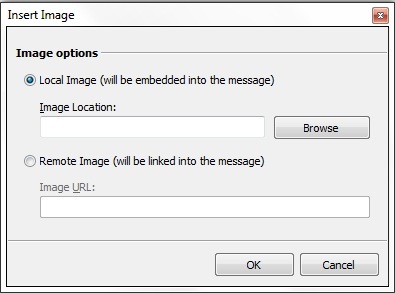 If you want to check the image path(s) of images that you have in your drafts or sent items, just right-click on the image in the GroupMail Message Editor and select Image Properties. Need Group Email? Get GroupMail Email Newsletter Software today!